GRAND RAPIDS, Mich. – In a continued effort to educate store guests and prevent accidental prescription opioid overdoses, SpartanNash is expanding its Opioid Safety Project to each of its 61 Michigan pharmacies. SpartanNash was the first major grocery retailer in Michigan to offer this kind of program and expand it throughout the state, with participating pharmacies located in its D&W Fresh Market, Family Fare Supermarkets, Forest Hills Foods and VG’s stores. 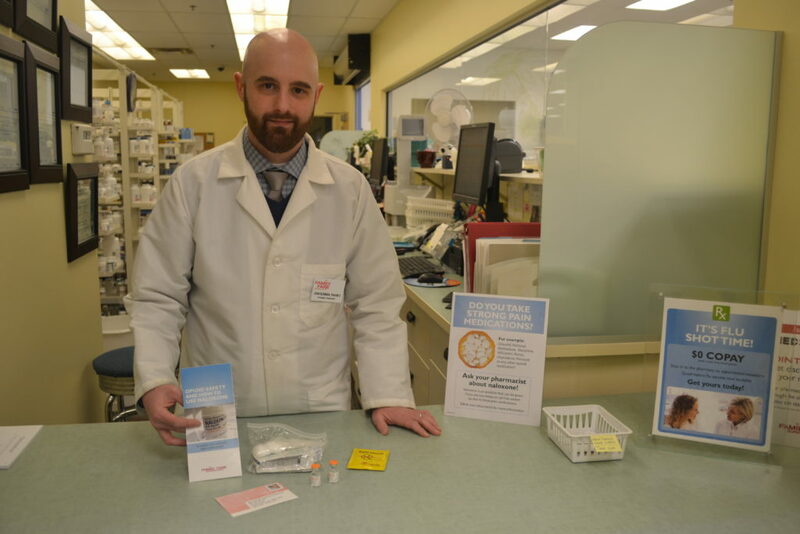 The Opioid Safety Project aims to reduce prescription drug overdoses by providing patients who visit SpartanNash pharmacies with naloxone – a life-saving medication used to reverse the deadly effects of opioid overdose – and education on how to identify, prevent and reverse an accidental opioid overdose. Pharmacy Manager John Bowman displays the contents of the overdose reversal kit at the Leonard St. Family Fare Supermarket in Grand Rapids. Located at 1225 Leonard, NE, the Family Fare pharmacy was one of three SpartanNash pharmacies that participated in the initial pilot program in 2016. The week of March 12-18 is National Patient Safety Awareness Week, and SpartanNash encourages store guests to be an active part of their own health care team by staying informed and involved in their own care and discussing their concerns with their pharmacist and other health care providers. When a store guest fills an opioid prescription from any physician, they are counseled by the SpartanNash pharmacist on safe medication use. If they are interested in an overdose reversal kit, they are also educated on how to properly use the naloxone should the need arise. The overdose reversal kit includes naloxone, a face shield for rescue breathing and an information pamphlet on the symptoms of an opioid overdose and how to give naloxone. The kit also contains an anonymous “Overdose reversal response card,” which encourages the patient or caregiver to provide feedback upon use of the kit. In order to expand the program to 61 pharmacies, SpartanNash pharmacists completed an online training program from Prescribe to Prevent, in addition to attending live training sessions led by the company’s clinical care team. The Opioid Safety Project began in April 2016 as a pilot program at three SpartanNash pharmacies in West Michigan before it was expanded to all D&W Fresh Market, Family Fare Supermarkets and Forest Hills Foods pharmacies in the greater Grand Rapids and Lakeshore area in November. Last year, SpartanNash pharmacists dispensed 85 overdose reversal kits. To participate in the statewide initiative, SpartanNash has partnered with Dr. Sandra Dettmann, M.D. of the Dettmann Center, P.C. The Grand Rapids-based addiction medicine physician authorizes all 61 of SpartanNash’s Michigan pharmacies to dispense the safety kit and naloxone medication to patients.